Let’s be blunt about something. The Democrats voting unanimously against these tax cuts is the dumbest thing, strategy-wise, that they’ve ever done. This fall, when the voters finally start tuning in, they’ll be hit with a barrage of ads showing Democrat after Democrat voting against the tax cuts that they’re benefitting from. 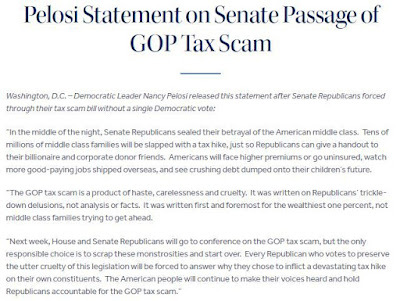 They’re benefitting from cheaper electric bills, bigger paychecks and fatter 401(k)s.
Here’s the money question: How many families in battleground districts will agree with Ms. Pelosi saying that the bonuses and pay raises they’ve received are crumbs? If that’s the most important issue to voters, the Democrats won’t just not retake the majority in the House. They’ll lose seats. 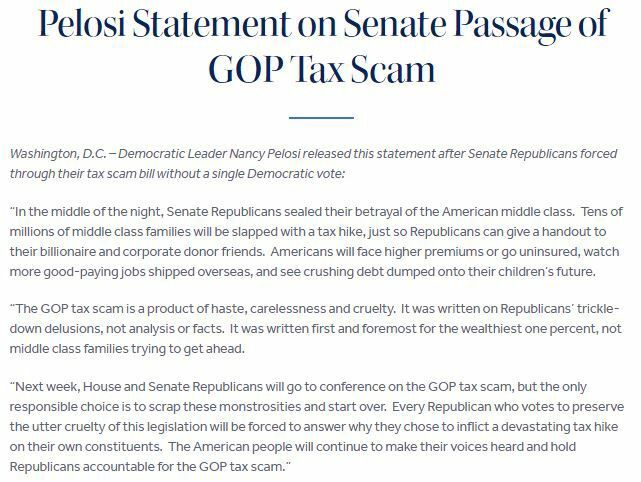 What this comes down to is that Paul Ryan’s statements at the end of his C-SPAN video sound thoughtful while Ms. Pelosi’s statements sound like a progressive hardliner elitist. It doesn’t take a rocket scientist to figure out that, politically speaking, thoughtful defeats elitist every time. It’s pretty apparent that David Frum’s TDS (Trump Derangement Syndrome) symptoms are showing. His article, titled “Conservatism Can’t Survive Donald Trump Intact,” is mostly a defense of Jennifer Rubin’s intellectually dishonest criticisms of Republicans. Still, with a title like that, it’s important to demolish the premise that Donald Trump is leaving the GOP in tatters. It’s important to rattle through the lengthy list of positive accomplishments that President Trump, with the help of Mitch McConnell and Paul Ryan, has helped turn into a reality. Prior to passing the Tax Cuts and Jobs Act, getting Neil Gorsuch confirmed was the signature accomplishment. Having him sit on the Supreme Court for the next 25 years is a major accomplishment by itself. One of the things that hasn’t gotten much attention but that’s playing a major part in the Trump Boom is eliminating tons of counterproductive regulations by using the Congressional Review Act. On a slightly different front, President Trump has reigned in presidential abuse of the Antiquities Act by shrinking a bunch of national monuments, thereby returning tons of acreage to local control. Passing tax cuts and getting Neil Gorsuch confirmed would be a pretty nice year if he got nothing else accomplished. The good news is that President Trump has gotten lots of other important things accomplished. Again, thanks to Mitch McConnell’s and Chuck Grassley’s efforts, 12 “fully qualified” conservative appellate court judges got confirmed in President Trump’s first year. President Donald Trump and the GOP-controlled Congress, who opened their first year in full control of Washington on rocky terms, are closing it with a flush of late legislative achievements: a sweeping tax overhaul, a long-sought repeal of a pillar of the Affordable Care Act and a surprise deal to open up Arctic drilling. I’ve repeatedly said that the economy is finally growing at a robust pace. Consumer confidence is soaring. Unemployment is at a 17-year low and it’s about to get lower. GDP is expected to grow at 4% or higher during Q4 of 2017. For years, the goal was for the United States to become energy independent. Thanks to rolling back a ton of Obama-era environmental regulations through the Congressional Review Act, the U.S. isn’t just energy independent. We’re on the verge of becoming energy dominant. For years, Republicans have talked about energy independence, cutting taxes, confirming the next generation of conservative judges and getting the economy hitting on all cylinders. President Trump and Sen. McConnell worked together to get the judges approved. Then Sen. McConnell and Speaker Ryan worked with President Trump to cut taxes, get the economy humming and delivering on energy dominance. To this conservative, I’m better than ok with that checklist of accomplishments. The start was bumpy but the finish of President Trump’s first year is pretty smooth. Apparently, the terms moderate Democrats and Blue Dog Democrats essentially don’t exist. The MSM have constantly criticized President Trump, mostly for his tweets but also for his lack of legislative accomplishments. Yesterday, the House and Senate passed the most sweeping tax policy changes in a generation. (Because of a couple provisions that ran afoul of the Senate’s parliamentarian, the Senate had to make a couple changes to the bill before voting on final passage. Because the 2 bills aren’t perfectly aligned, the House will vote this morning on the bill the Senate passed last night.) Once the identical bill is passed in both the House and Senate, it will be sent to the White House for President Trump’s signature. Trump has followed through on eviscerating regulations, many of them imposed by Obama. He has revoked 67, and delayed or derailed more than 1,500 others. This has helped spur economic growth. It’s the single-biggest reason why the economy is robustly growing thus far. All the time that the MSM highlighted that Trump didn’t have any major legislative accomplishments, President Trump worked with Congress to eliminate tons of counterproductive regulations. That’s the single-biggest reason why economic growth took off when he took over from President Obama. Trump has tilted the court rightward in lasting ways. Justice Neil Gorsuch was a substantial, conservative addition to the Supreme Court. And it wasn’t a one-off: The dozen new U.S. Circuit Court judges he has named is the most during a president’s first year in office in more than a century. Isn’t it fun watching Gutfeld stick the shiv into liberals, then giving it a sharp twist? I commend my Senate colleagues for this historic action. For the first time since 1986, both the House and the Senate have passed a major overhaul of our nation’s tax code. Now we will move quickly to a conference committee so we can get a final bill to President Trump’s desk. The hardworking people of this country are counting on us to deliver real relief. That means more jobs, faster economic growth, bigger paychecks, and a tax cut for Americans from all walks of life. These opportunities only come around once in a generation, and now it is time for us to seize this moment. Let’s be clear about this. Not a single Democrat voted for the bill in the House or Senate. Further, when President Trump invited Ms. Pelosi, Sen. Schumer, Sen. McConnell and Speaker Ryan to negotiate a budget deal, Pelosi and Schumer were no-shows. Sen. Schumer has expressed a willingness to shut down the government if the bill to fund government operations includes funding for building Kate’s Wall along the U.S.-Mexican border. Summarizing things, Democrats hate cutting taxes, want to shut down the government and oppose building a border wall that will keep illegal aliens, drug smugglers and human traffickers out of the United States. In other words, they don’t want to fund the government, protect the people or implement policies that grow the economy. Other than that, they’re great. Senate Majority Leader Mitch McConnell (R-Ky.) said on “The Daily Briefing” today that he expects to have some Senate Democrats support tax reform. He told Dana Perino that there are “at least three” Democrats in the Senate who have signaled they’re likely to be a “yes” on tax reform. Let’s set something straight. Democrats are too invested in the Resistance to do the right thing. Telling the truth isn’t part of their action plan. With today’s Democratic Party, ideology trumps doing what’s right. Later on the show, Sen. Chris Van Hollen (D-Md. ), a member of the budget and appropriations committees, said the plan is a $2 trillion “windfall” for big corporations, insisting that middle-class families will see higher taxes. “There are millions of middle-class taxpayers who will see their taxes increase in order to provide tax breaks for multinational corporations,” said Van Hollen. He said there are a number of proposals from the Democratic caucus to help working and middle-class families, specifically with child care costs. Notice van Hollen’s trickery? He isn’t interested in across-the-board tax cuts nor is he interested in tax simplification. He wants specific carve-outs for voting groups he wants to keep voting for Democrats. Further, van Hollen’s idea of tax policy keeps lawyers, lobbyists and accountants fully employed. The GOP plan hopes to limit complexities in the tax code, thereby reducing the cost of tax compliance. Reducing the cost of tax compliance is a major reduction in expenses to small businesses. To entrepreneurs, cutting compliance costs is just as welcome as cutting tax rates. Either way, it’s more money in their pockets. Scalise also made special mention of Rep. Brad Wenstrup, saying that without his tourniquet, he wouldn’t have lived. Scalise noted that Rep. Wenstrup is a doctor and a former combat surgeon who served in Iraq. The truth is that it’s time to set aside disagreements while elevating the debate on both sides. This is a teaching moment for both political parties. For instance, Republicans need to learn when to accept three-fourths of a loaf in negotiations rather than insisting on the entire loaf. The Democrats have a tougher task. They’ve lost the ability to make rational policy arguments. The other problem that the Democratic Party has is that their most amped-up activists think people who don’t agree with them essentially as infidels. They don’t see conservatives as just wrong on policy. The hard left that James T. Hodgkinson was part of thinks of conservatives as evil. Hodgkinson himself was part of a far left organization that called for violence against Republicans, including President Trump. An upstate New York congresswoman already in shock at the shooting of her colleagues at a baseball practice also received a chilling email entitled “One down, 216 to go.” Claudia Tenney, a freshman representative from the Utica area, received the message Wednesday in the hours after her fellow House Republican Steve Scalise, from Louisiana, was shot in Alexandria, Va.